Just spotted a kettle that will fit perfectly into my legally blonde styled pink kitchen!! It’s quite expensive because it’s made by le creuset. I’ve just spotted another really cute dog item — a pink jumper with wooly bobbles for my dog!! I don’t think my boyfriend will be happy with me tonight buying all these dog items! Cute PINK dog collar and lead!! 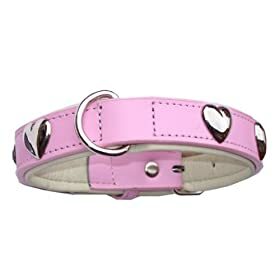 Wow – I’ve just seen a really cute dog collar and lead that I’m going to get for my little dog daisy! I think it would fit perfectly into my legally blonde ‘style’! Take a look – it’s even got little hearts on in silver! It’s £17.49 – but it looks perfect – I’m sure she’ll love it.